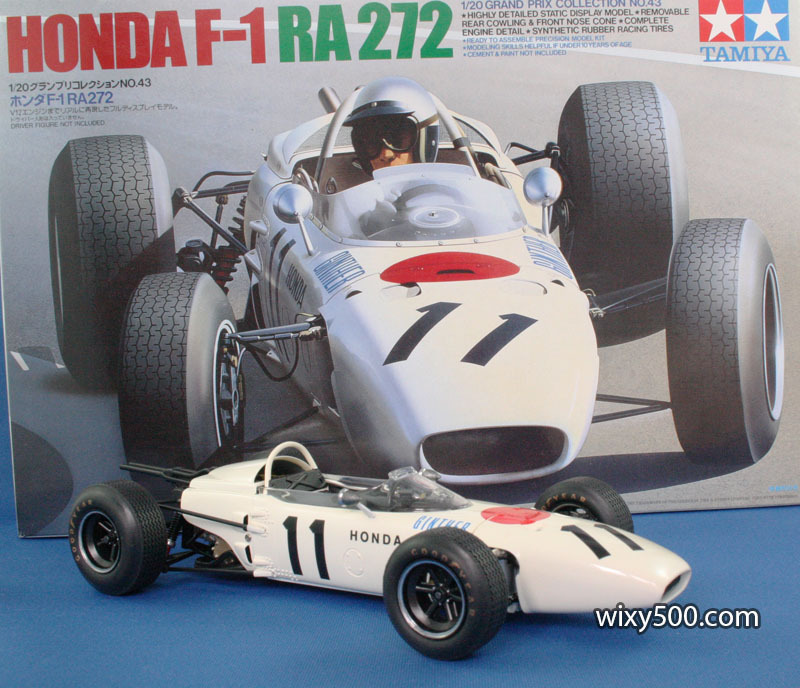 The RA272 was Honda’s Formula One race car for the 1965 Grand Prix season. 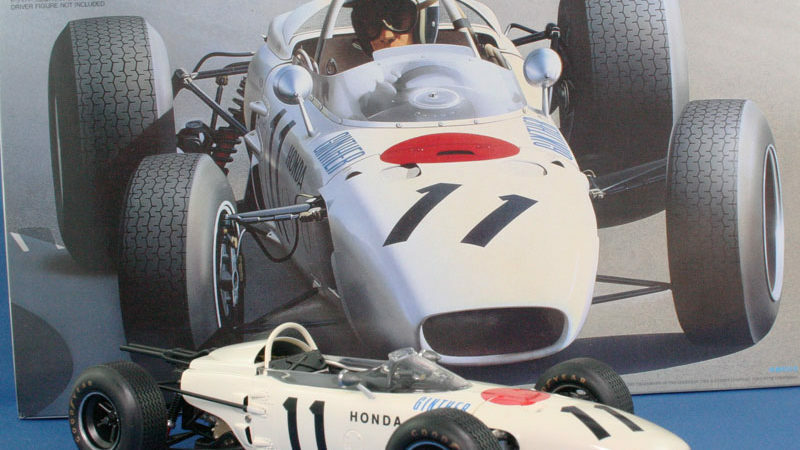 It was a full factory effort, the Japanese manufacturer building the entire car – chassis, engine and gearbox. 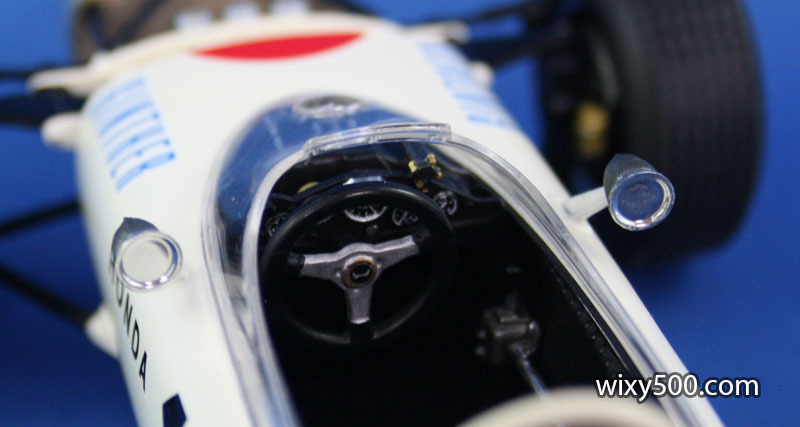 The car featured a 1.5 litre V12 engine, but it was mounted transversely (crossways) directly behind the driver. Rocker-arm front suspension and trailing arms with coilover shocks at the rear was standard technology for the time. 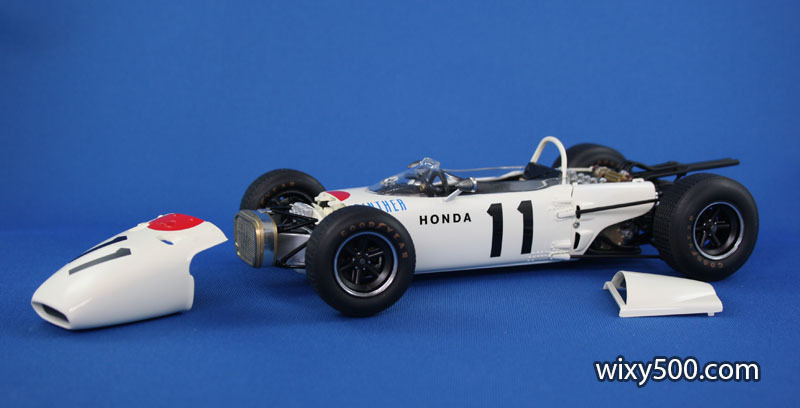 Honda’s driver from its first F1 season in 1964, Ronnie Bucknam, was joined by fellow American Richie Ginther for 1965. 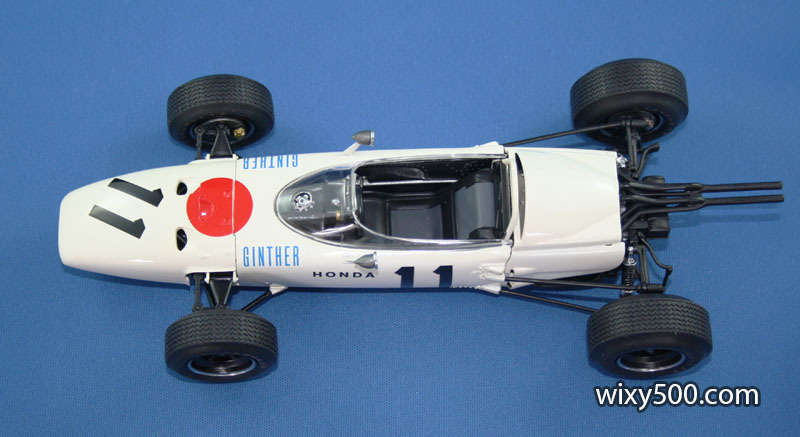 Ginther took Honda’s (and, as it turns out, Goodyear’s) first F1 win at the 1965 Mexican Grand Prix, and it’s this race that Tamiya’s 1:20 scale kit is based. The win helped Ginther to 7th place in the World Championship. Bucknam was classified equal 14th. 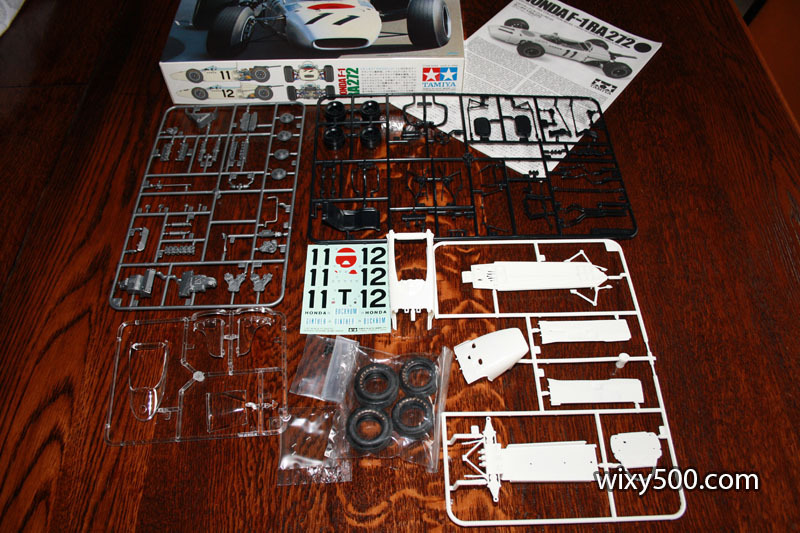 Tamiya’s model, kit number 20043 in the Grand Prix Collection series, was released in the late 90s. The unboxing, all the parts in their bags. My kit has box art of a frontal view painting of the car. 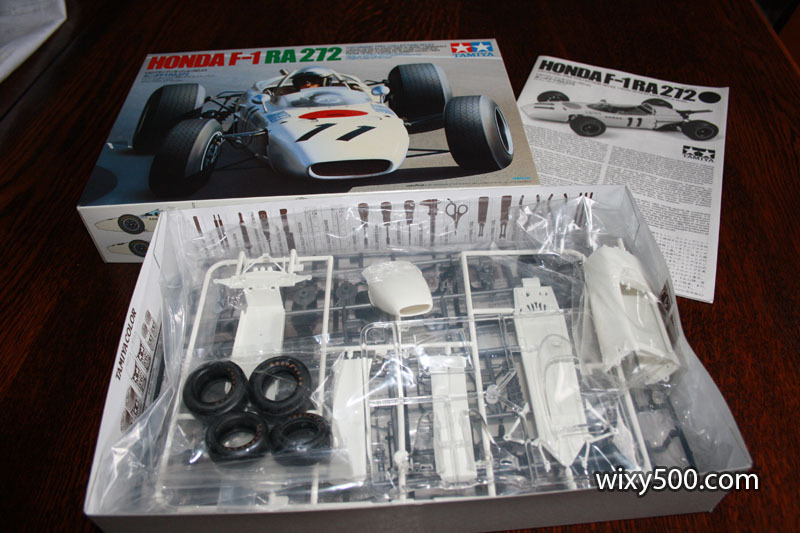 There is an alternative box that has a rear view photo of the model itself with the engine cover off. 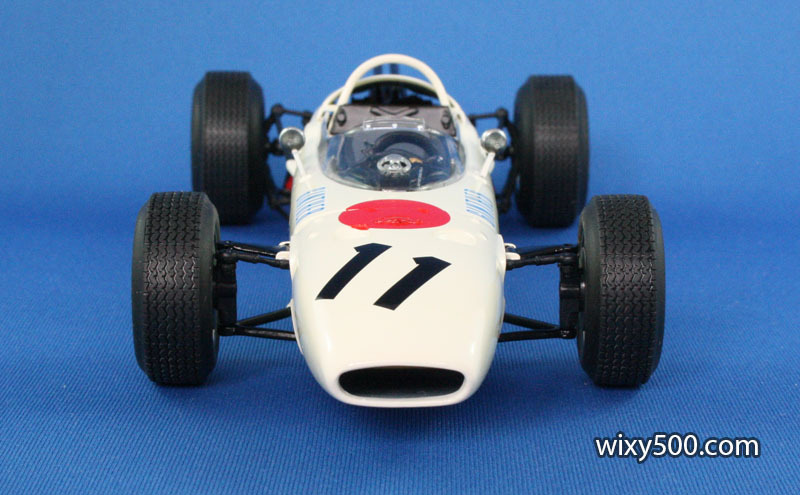 Very few decals in this kit but they include the markings for both drivers. Sprues are cast in grey/sliver, black, clear and ‘ivory white’ for the body parts. 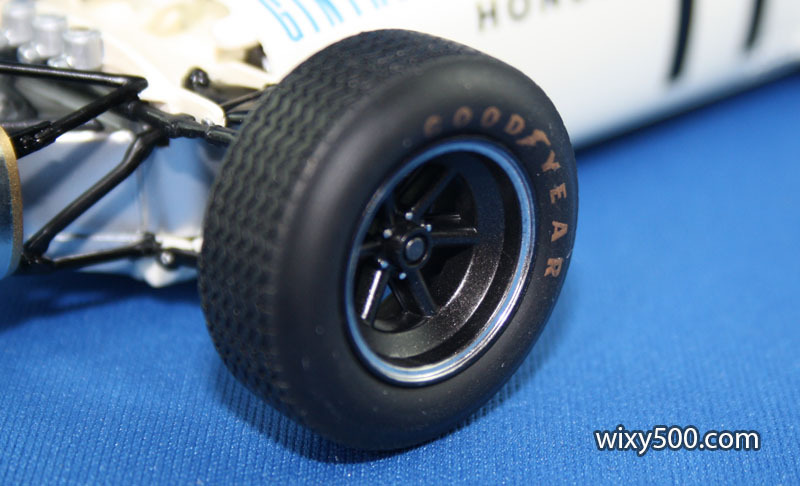 The tyres feature a really nice tread and already have Goodyear identification printed on the sidewall. 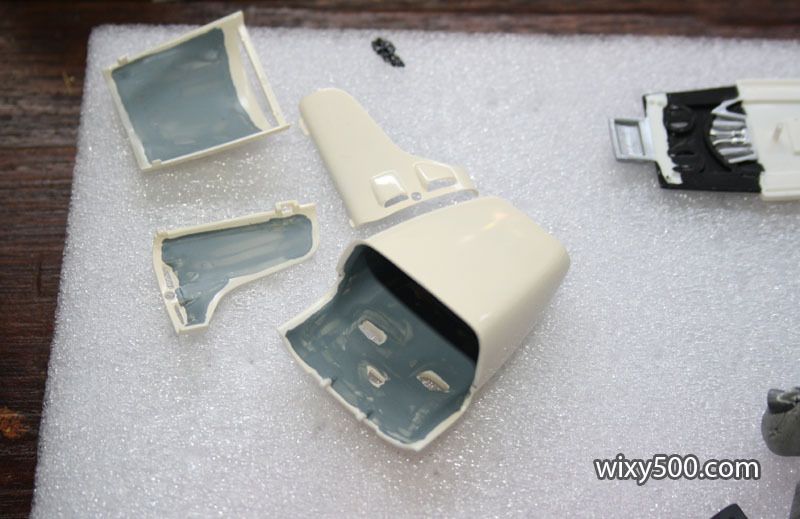 All of the exhaust pipe outlets are molded with a blunt end (right pipe) which is unacceptable in a kit of this scale. I used my pin drill to give a tubular effect (left side). I decided to try a different method with the build of this kit. 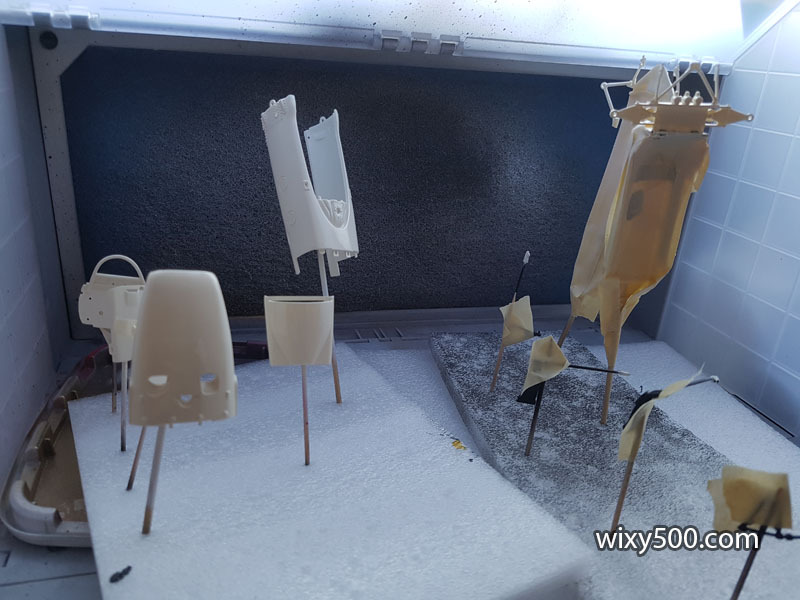 While enjoying a lazy day watching the Supercars on TV, I prepared each and every part (cutting off sprue, removing mold lines and general cleanup of each piece) so they were all ready for paint. 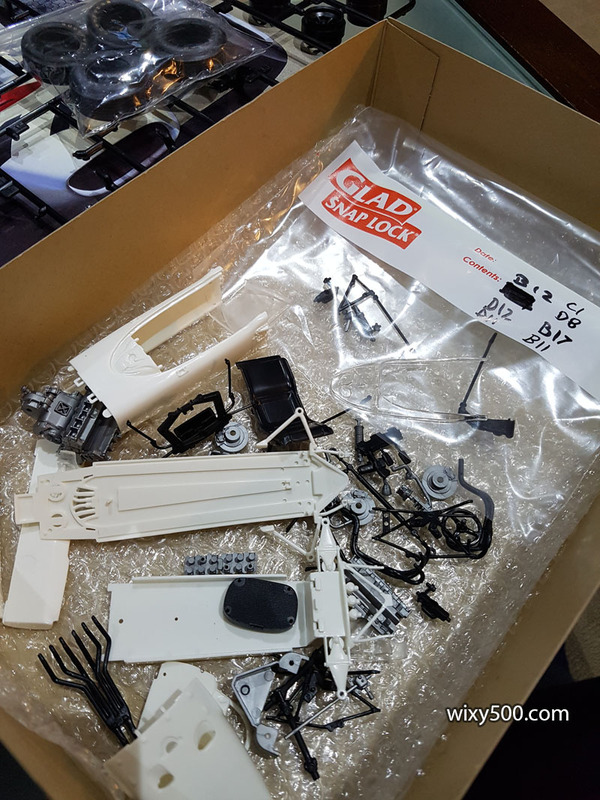 A few sub-assemblies were started as they were painted the one colour, such as the engine block, exhaust pipe sets and some of the rear suspension. 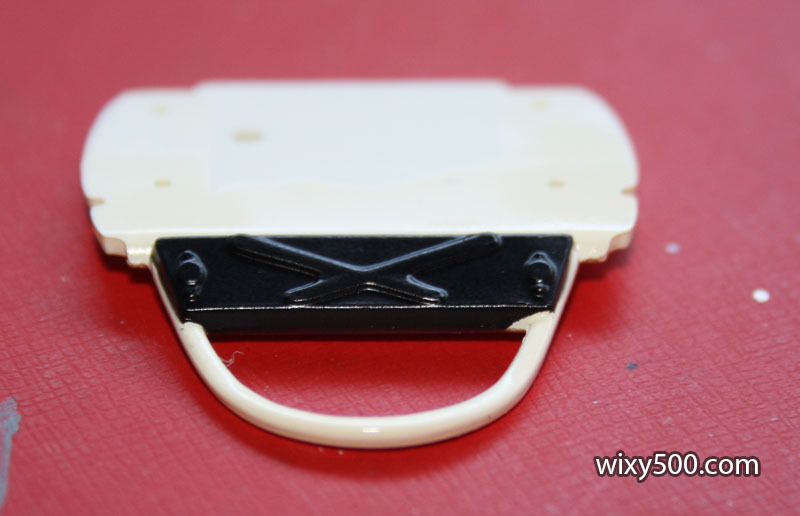 Plastic snap-lock bag holds the part numbers indicated so I don’t get Left and Right side pieces mixed up, or lose a couple of really tiny parts. 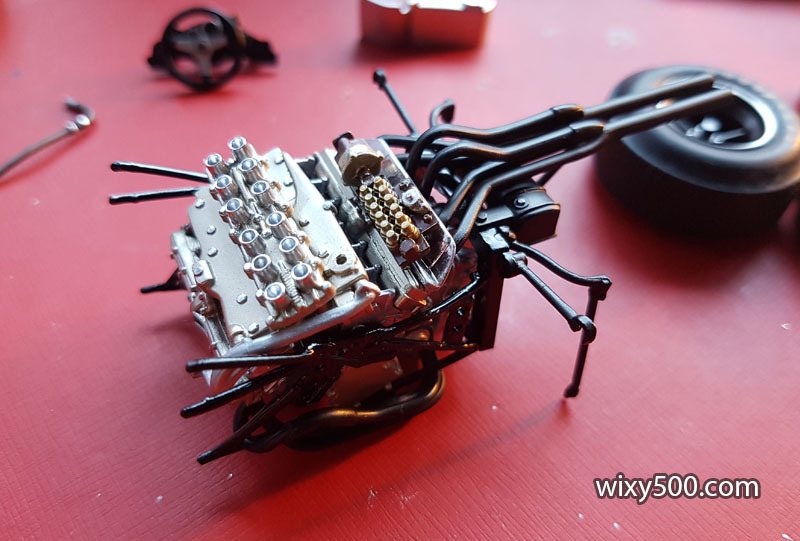 The Honda V12 engine mostly done. I didn’t use the colours specified in the instructions, instead I referred to period photos of the car which differ to present-day pics of restored machines. 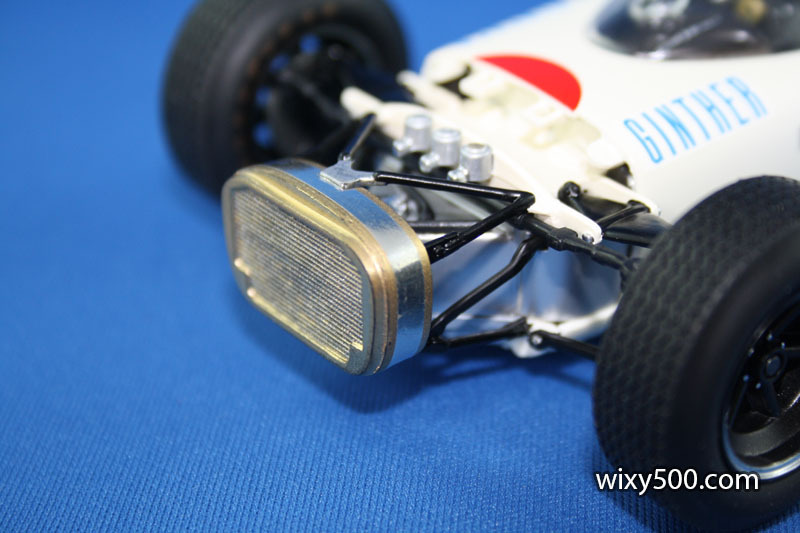 I used Tamiya’s TS-87 Titanium Gold for the rocker covers etc as I think it better represents the real car. 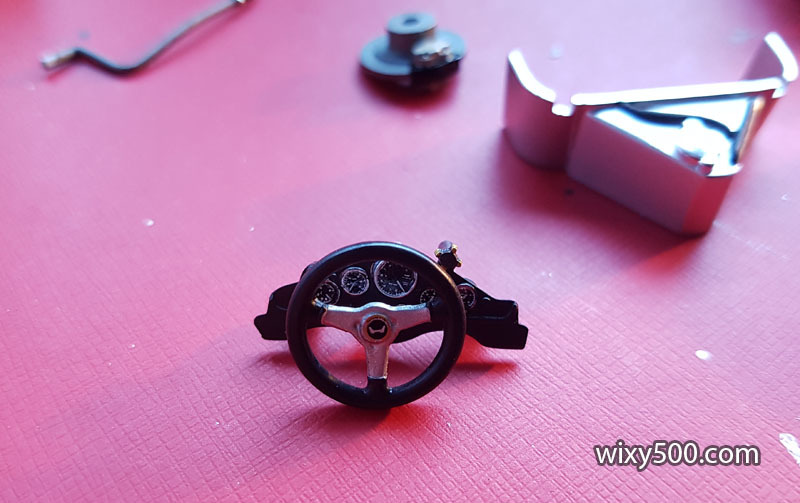 Steering wheel and dashboard done. 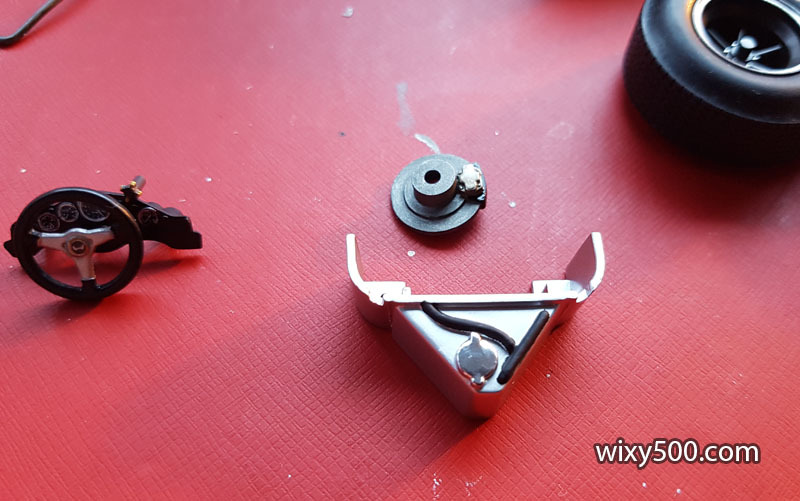 Steering wheel / dashboard assembly, a brake disc & caliper, plus part of the fuel tank that will sit behind the radiator in the nose of the car. Completed wheels. 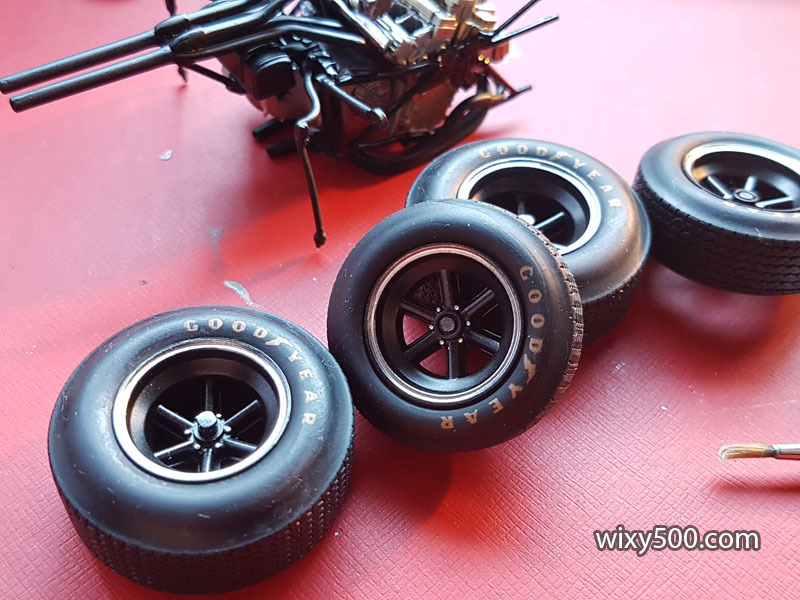 The instructions call for these to be semi-gloss black, but photos show the wheels to have a dark metallic look. I mixed a little gun-metal in with the black and like the result. The machined rim edge and wheel nuts were done with a Molotow Liquid Chrome pen (1mm tip) that I found in a local art supplies shop. Some primed body parts drying. 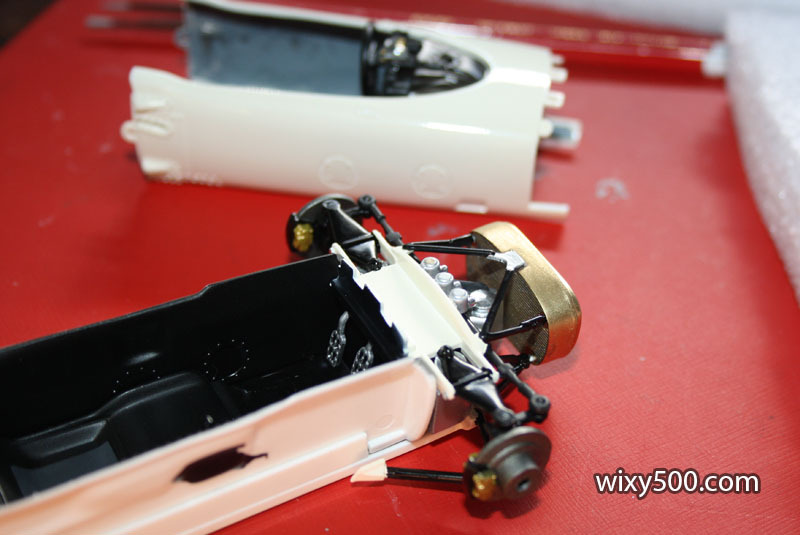 I used Tamiya white primer straight out of the TS can. 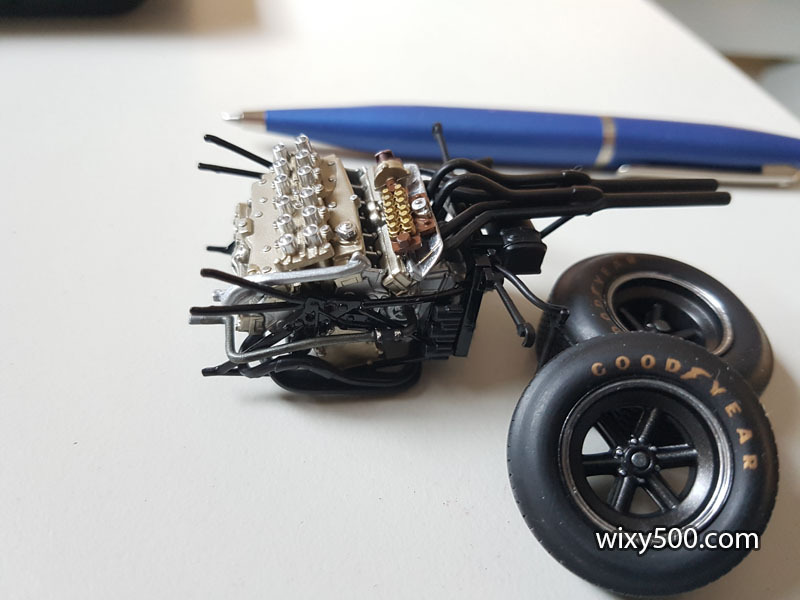 The completed engine and a couple of wheels near a pen for size reference. 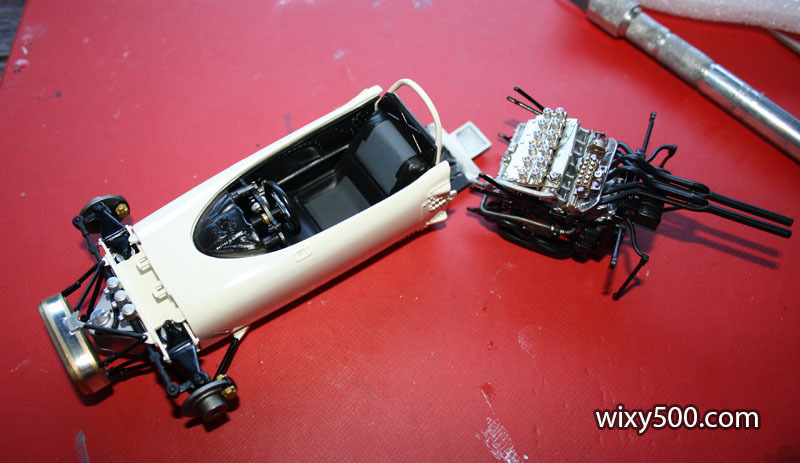 The kit does lend itself to further detailing – such as fuel lines and ignition wires – but I’m building it pretty much box-stock. Airbrush for the body colour, here the second coat is drying. 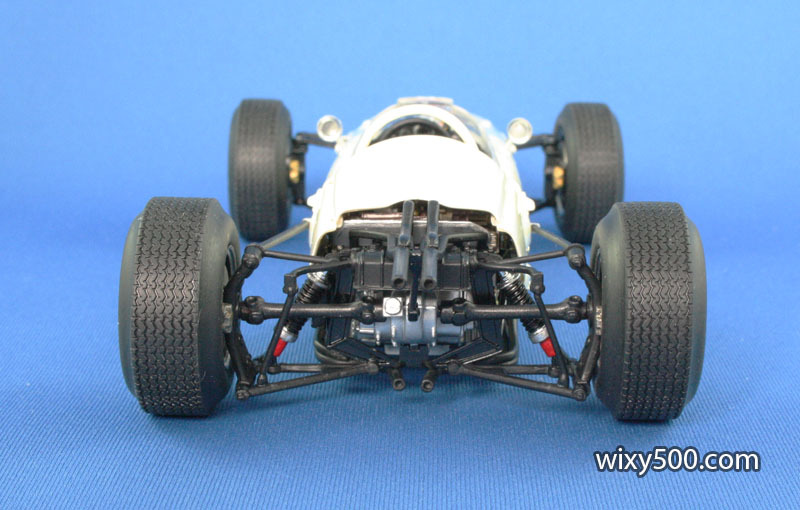 I mixed a little Tamiya TS-26 ‘Pure White’ with the recommended Tamiya TS-7 ‘Racing White’ as I reckon the TS-7 alone is a little too yellow. 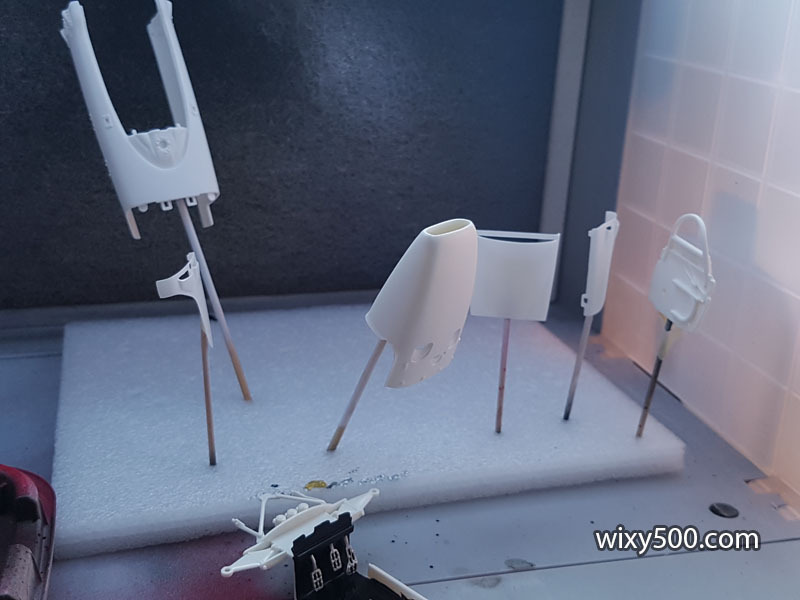 As the bodywork is quite translucent when lit from behind, I decided to brush some grey on the inside of the body panels. They got two coats (pic is after the scratchy first coat). 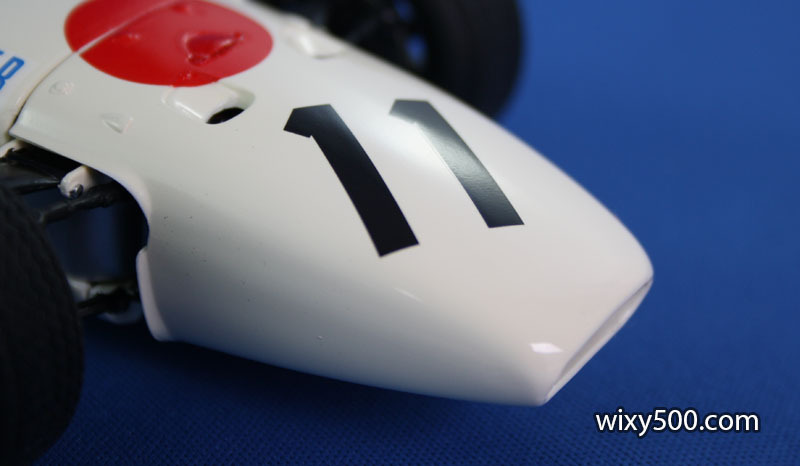 The outside of the panels were polished with Tamiya compound. Nice clean masking line in the recess where the windshield will fit. Mask and spray was definitely the right choice, but I need to lift my game with the masking. 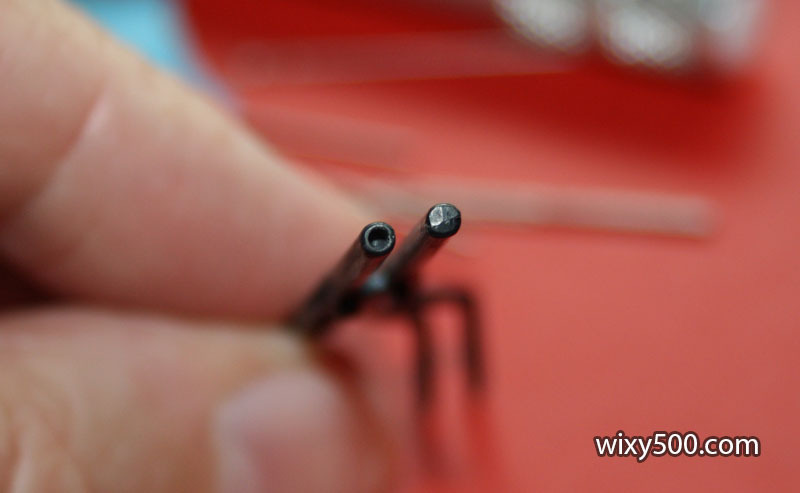 This small bit that was missed had to be finished by hand. 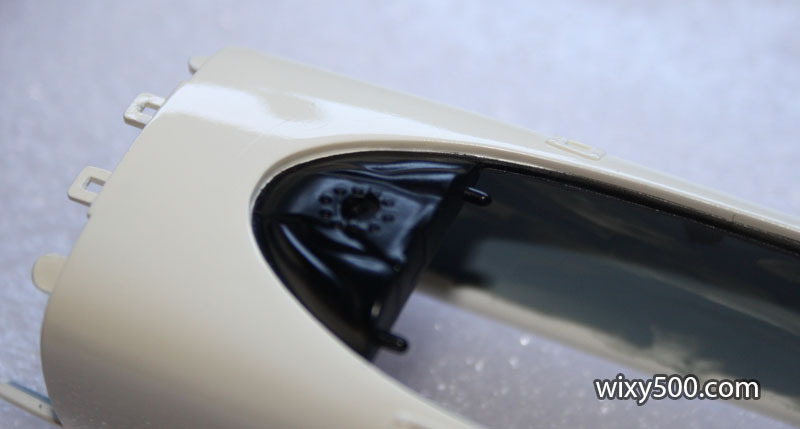 Once the inner cockpit panels and rear bulkhead are in place, the outer skin of the monocoque can be fitted. 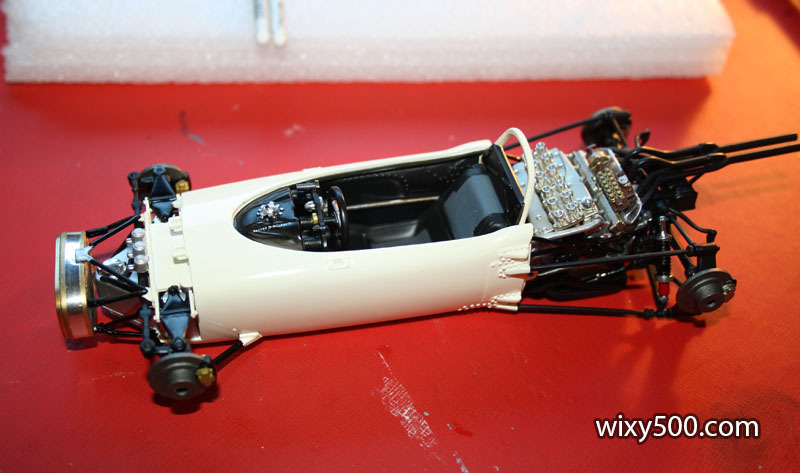 Chassis and engine about to join. 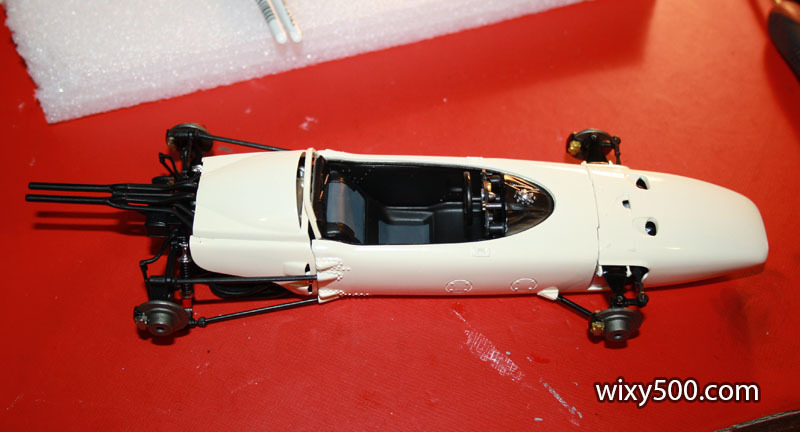 And with the bodywork fitted. 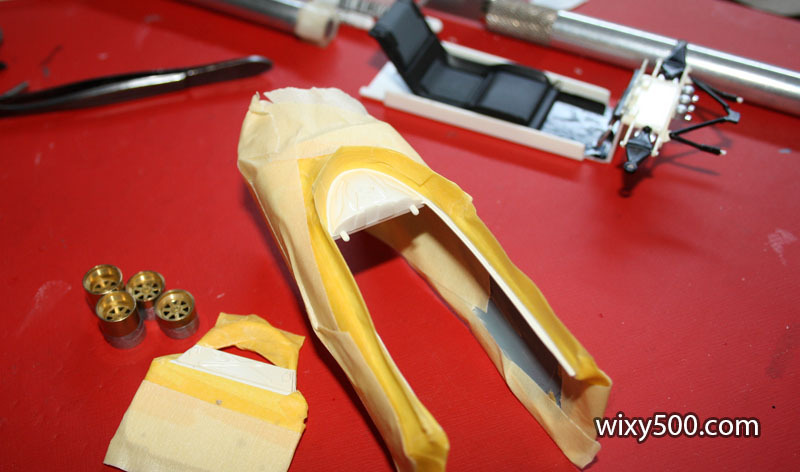 The nose cone and engine cover are removable (as are the covers on the side of the engine, but they require a small screw driver). 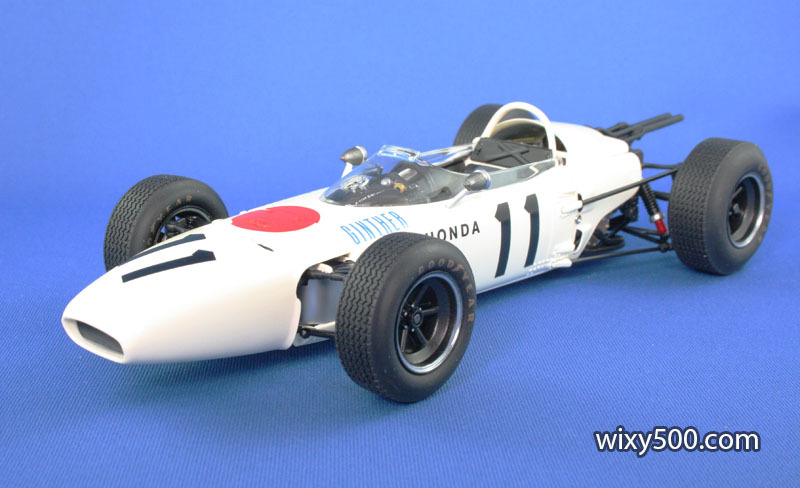 You could build this model with see-thru engine covers as all three pieces are moulded in clear. A strip of baremetal foil surrounds the radiator. A light metallic grey wash was brushed over the fin area. 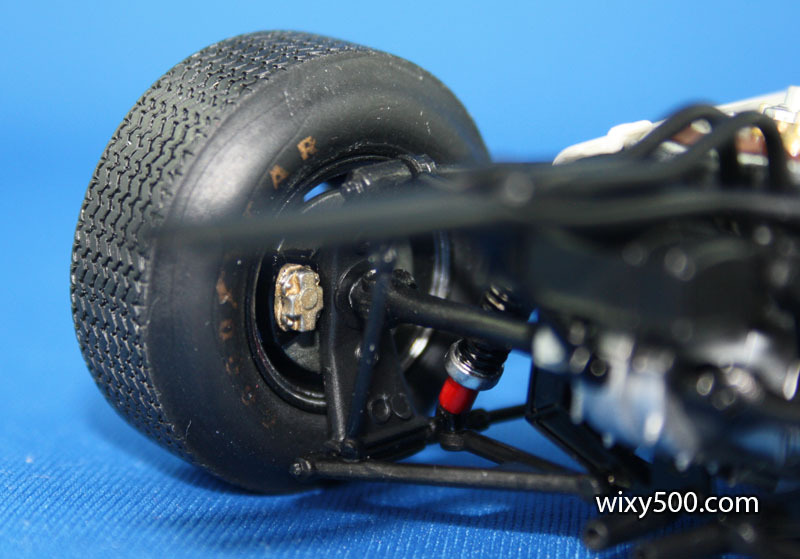 Brake caliper and rear suspension detail. Driveshafts do not rotate. Each race number was one big decal meaning there was a lot of clear decal film between the two digits. I cut each digit out and applied separately. I was really happy with how the metallic look came up on the rims. The result of a 4 month build with the original box.